When it comes to replacing teeth and restorative dental work, you deserve a specialist. Dr. Libman offers an unsurpassed combination of credentials and clinical experience. He receives referrals for the most complex treatments from respected Northwest dentists; who named him “Top Prosthodontist” in a report by Seattle Magazine. Whether from an accident, or as part of the aging process, dental problems can make eating and even talking more difficult and uncomfortable. Thanks to today’s dental technology and experts like Dr. Libman, there is no reason to miss the functional pleasure of a healthy mouth. Click to learn more about our Restorative Services. 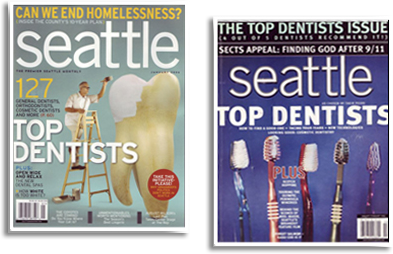 Dr. Libman was named “Top Prosthodontist” by his professional peers in every “Top Dentist” issue of Seattle Magazine and Seattle Metropolitan magazine. Every Relationship Starts with a Smile Anyone can look younger and healthier with bright, beautiful teeth. Restoring or improving our smile is an investment that provides returns every time we meet someone or interact with a client. Click to learn more about our Cosmetic Services.